I’m back again with another holiday gift guide blog post! This time around, we are moving away from the crowded malls that people want to avoid during the season whenever possible. No, we aren’t shopping online. That can be easy, but then there are shipping costs and hoping it arrives in time. Today we are talking about the handmade gifts that you can gift someone. Supporting local crafters and independent companies is always a great feeling. 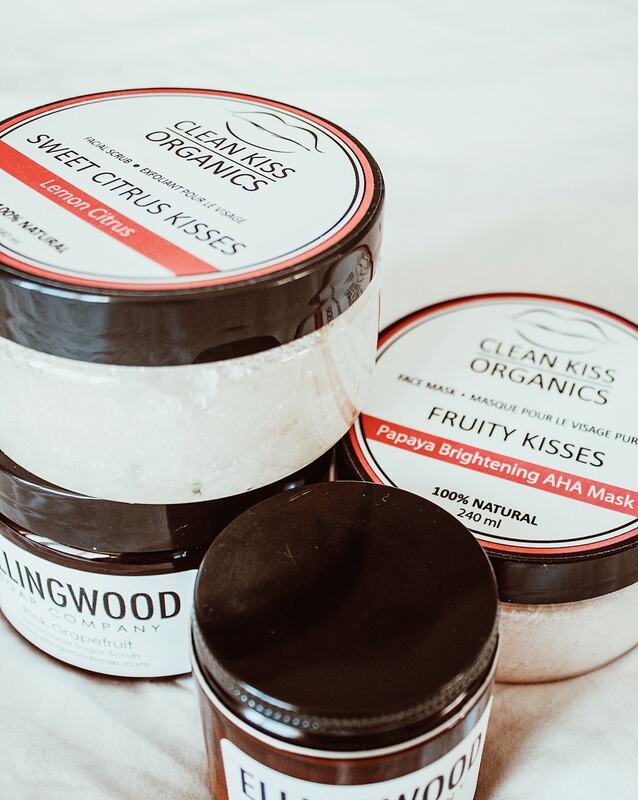 I will be discussing two specific brands in the blog post, which are Clean Kiss Organics and the Ellingwood Soap Company. I’m from Hamilton, Ontario and like to give love to companies that are based in the same area. The first brand I am going to talk about is Clean Kiss Organics. It is a brand of natural and chemical-free alternative products for body, face, hair, and home. They create the type of products that go perfectly in a gift basket full of pampering body products. For example, their Sweet Citrus Kisses Lemon Sugar Facial Scrub is a great treat year round, but also ideal for the winter. Skin is battling harsh cold temperatures during the winter months, and any sort of scrub is going to make sure you are treating your skin with the best ingredients. This particular face scrub is made with fresh organic lemons with rich oils. Using this scrub provides your skin with a natural exfoliator to help reduce wrinkles and fine lines, lighten dark spots and pigmentation, and exfoliate away dry skin. Another example of a great product to gift this season is a face mask. Their Fruity Kisses Paypaya AHA Brightening Face Mask is not commonly made by most smaller scale natural skin care brands. The face mask is different from a face scrub because it is supplying a lot of hydration to your skin. This particular mask is helping brighten up your skin if you suffer from dull skin. With tropical scents of guava, papaya, and mango, this face mask will be a daydream waiting to happen. Everyone can appreciate a brighter and healthier looking complexion! This face mask is powder-based, so you have to mix a bit with warm water to get that creamy mask consistency. Next up, we will be taking a look at the Ellingwood Soap Company. They have a range of all natural handmade vegan candles, soap, and body products made locally in Hamilton. Continuing the idea of preparing gift baskets of handcrafted gifts for people on your list this holiday season, here are some more ideas! 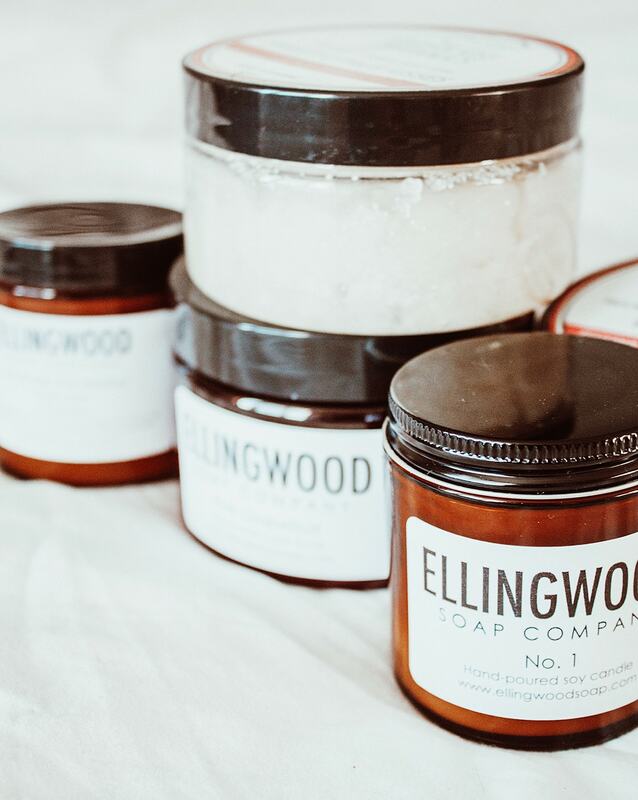 Ellingwood Soap Company create a great selection of hand-poured soy candles! These have a list of scents for these candles, all created with essential oils and natural resins. Consider it like an oil diffuser but in candle format. All candles are made from soybean oil sourced in North America. 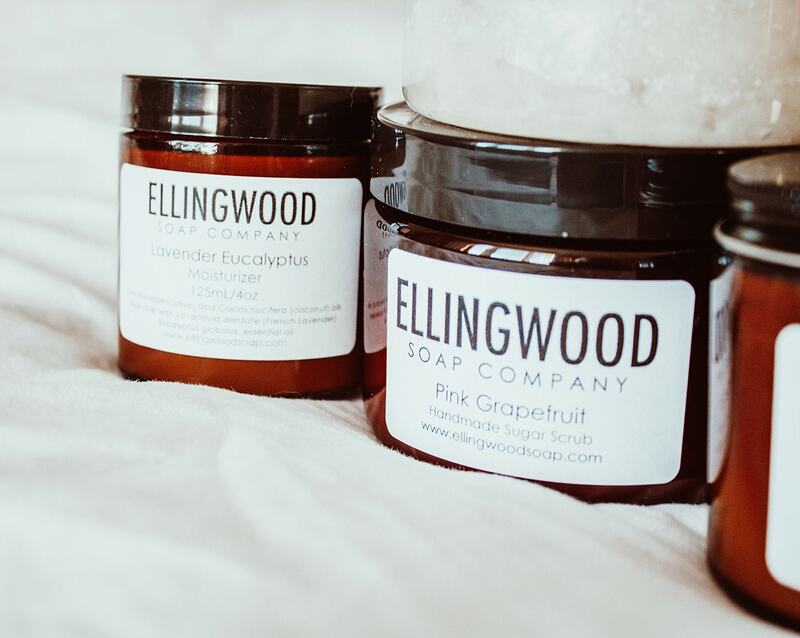 Just like Clean Kiss Organics, Ellingwood Soap company also creates a variety of scrubs. The handcrafted all natural sugar scrubs are made up of a combination of coconut oil, olive oil, and pure essential oils. They have some amazing scents, such as Lavender Eucalyptus, Peppermint, Rosemary Lemon, and Pink Grapefruit. They took the extra step to store their sugar scrubs in PET jars, which are reusable, recyclable, and safe to keep in the shower. A company that makes handmade body products would not be complete without a moisturizer. Their moisturizers are made from coconut oil, olive oil, and essential oils, so you know you are getting the best naturally hydrating ingredients. This moisturizer is non-greasy, so it will not make your skin feel oily afterwards. It may be a small jar, but a little bit of this product does go a long way. Interested in any of the products mentioned above? You can buy all the products online, or you can view them in person at the Craftadian Christmas Market! It is taking place at McMaster Innovation Park on December 2 from 10 am – 4 pm. The $5 admission helps support the Shoebox Project, that will be directly helping women in shelters across Hamilton. This event will also be giving away 50 free swag bags filled with handmade goodies, including an Ellingwood candle! Do you have any favourites when it comes to handcrafted products like these? Leave them in the comments below. Sometimes the handmade gifts seem a little more personal than a Bath and Body Works candle.